The aluminium section, at only 16mm (0.6") depth with a 25mm (0.98") wide snap frame, is an ultra slim and attractive light box with neat rounded corner pieces. Simply snap open the front frame change the poster and snap shut - it's simple and convenient. Standard Size (inches) - Available Any Custom Size up to 96" X 48"
These are available in any size from A4 size to 2440mm X 1220mm (96" X 48") and can work without any discoloration of the LED light box, caused by heat dissipation. 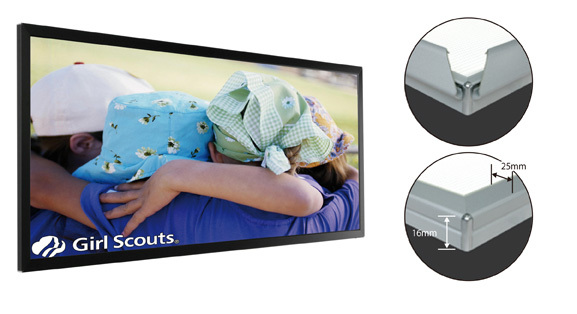 Offering with 16mm's depth of LED light box provides the most even brightness all over the surface. Our LED light box will present the finest quality of all and stand out among all the graphic images in the complex.